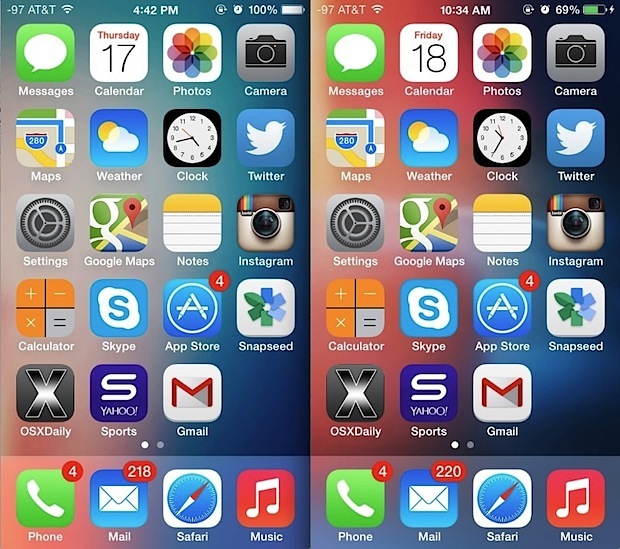 Many have noticed that iOS 7’s overall appearance is largely dependent on the devices wallpaper, and a good or bad wallpaper can make or break the look of things along with general usability, particularly for the home screen. 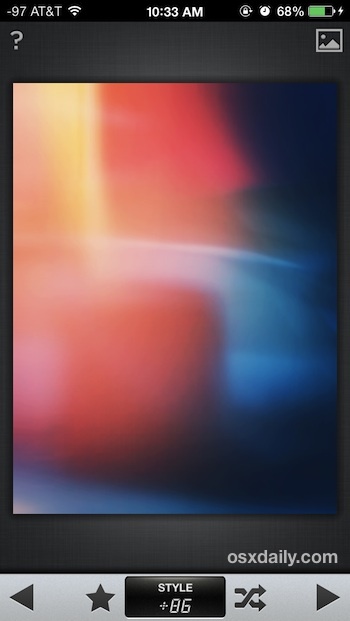 It turns out that some of the best looking wallpapers on iOS 7 are very abstract, multicolored, blurry images, and that’s what we’re going to focus on making here. 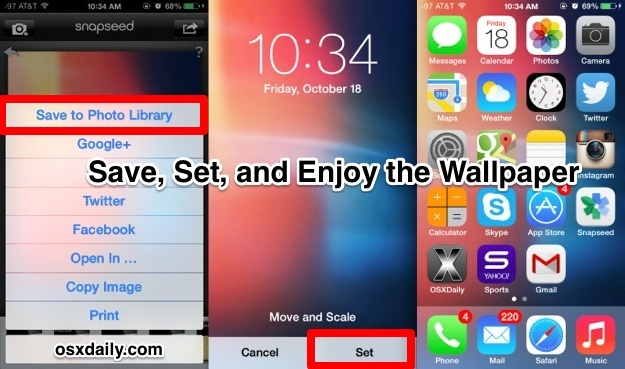 I’ve sort of perfected a quick formula for creating nice wallpapers in iOS 7 directly on an iPhone, iPad, or iPod touch, using an excellent free photo editing app called Snapseed. 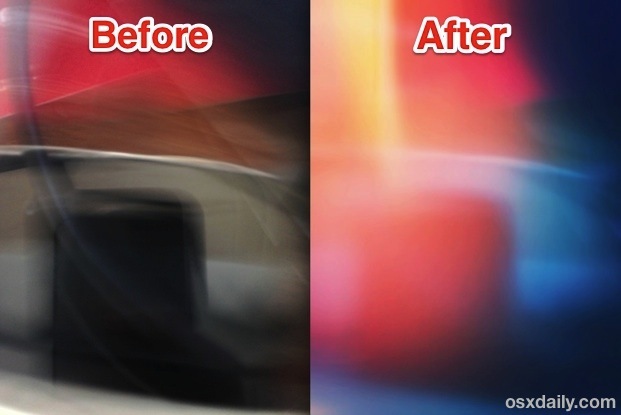 Snapseed is really great at making very nice professional looking photo adjustments on the go, but we’re going to use it to go the other direction; make a bad photo look even worse, thus creating an abstract blurred image that actually makes an excellent wallpaper. 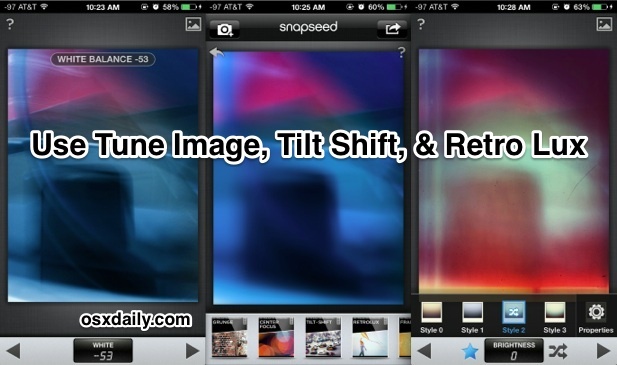 Before doing anything else, you will need to download Snapseed from the App Store for iOS, it’s free and works great on any iPhone, iPad, or iPod touch. The Snapseed UI is a little odd at first but after a minute or two of playing around you’ll figure it out and be a master. It’s very gesture based, with tap-and-hold bringing about filtering adjustment options, and swipes left and right to boost or reduce filter strengths. We’re not doing a general tutorial for it here but don’t worry, you’ll figure it out quickly for these purposes. Are you bad at photography? Me too, so you and I are going to be great at this. 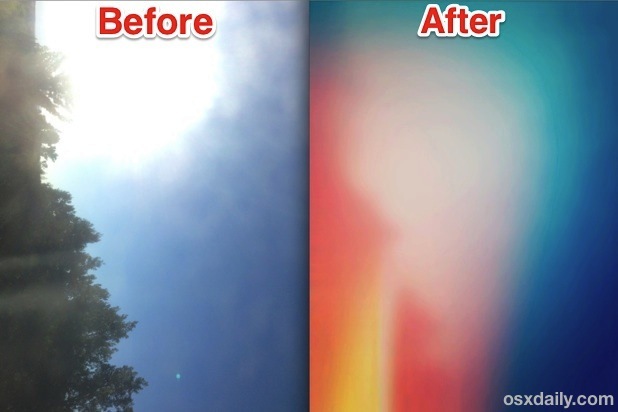 Yes, seriously, break out the iOS Camera and take an awful picture, the worst you can imagine. My preferred trick for taking a bad picture is to start waving the iPhone (or iPad, but don’t accidentally hit anyone with it please) from side to side over your mismatched hyper-color socks, a messy tangle of multi-colored computer cords, or your coworkers face the next desk over while he’s telling you to stop or he’ll report you to HR. Hit the shutter button while the camera is moving, the result will be some blurred out garbage photo that you’d normally toss out immediately. Yup that’s perfect, you’re such a good artist. OK if you’re not sure what we mean by a bad picture, here are two examples of awful photos that quickly turned into great wallpapers. This is a blurry photo of a couple USB cables, an iPhone charger, a MacBook, and a Starbucks gift card. Looks awful you should be ashamed of yourself right? Bingo, it’s a beauty for this assignment and turned into a great wallpaper! How often do you get an assignment with the first step being ‘do something poorly’? This is a bad photographers slackers paradise right? I mean it, the crappier the picture the better the results. Just about any bad picture will do, but try to get some contrasting color elements and blurred in there, or not, just make sure it looks bad. Still looking pretty awful, huh? Yup sure is, and you’re almost done! Retrolux is a hipster paradise filter within Snapseed that intends to make photos look like they came from a broken 1970’s Polaroid camera, complete with severe overexposure, textures, and light leaks. It looks genuinely terrible, meaning it’s perfect for what we’re looking to do here. Wait what, what just happened? That ugly piece of garbage is suddenly a beautiful abstract multi-colored wallpaper just like you’d find in some wallpaper roundup post of digital abstract beauty. And you made it all yourself, you artist you. Give yourself a star sticker, Pablo. 4: All Done, Set Your Wallpaper! Now that all the hard work is over in a grand total of one minute, you’re ready to temporarily retire from your newfound career as an abstract artist and set that beautiful masterpiece as your wallpaper (assuming some glorious patron of the arts doesn’t buy it first right?). Do that through the normal means, whether through Settings > Wallpapers & Brightness, or through Photos > tap the photo > choose Use As Wallpaper. Looks pretty great, doesn’t it? 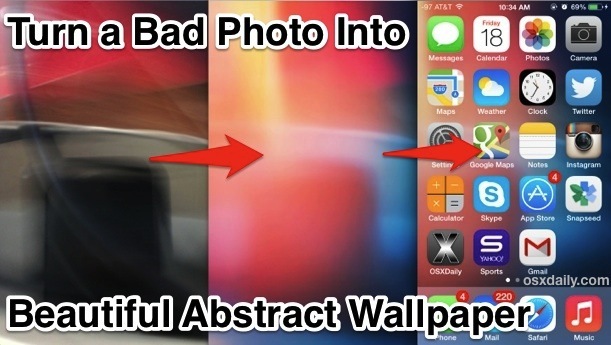 Here are the two images used in the bad picture example sitting pretty as wallpapers. Shed a tear in awe of their beauty. Ok you’re on your own now, take some awful pictures and have fun!